Time to dive into Batma–I mean Locke’s theme. Locke is the thief of the group, or as he likes to call himself: treasure hunter. From the start of the game he is introduced as a spy for the Returners who has a drive to protect all the women introduced to him (pretty noble for a thief I’d say). As all of the other heroes of the game he has a tragic back story caused by the Empire which, as everyone else, sums up the way he is now. The difference in his backstory is a big portion of it he blames himself, so on top of the Empire hating he is always struggling with his own guilt. To sum it up he had this girl named Rachel (Locke’s the Batman) who while on the way to asking her hand in marriage, saved by pushing him out of the way Locke and took a fall down a bridge. This fall caused her to loose her memory in in her father’s anger forced him out of town. Locke left for a year, and in this time the Empire attacked their town killing Rachel. In her last moments he memory returned to her and the last words she spoke were these: “If a man called Locke should ever return, please tell him that I love him.” Locke heard about the attack too late and returned to a destroyed town and a dead Rachel. Overcome with guilt he did everything he could to revive Rachel. He brought an herbalist in to preserve her body in a young state while he found the Pheonix esper which is said to bring people back to life. Near the end of the game, after the dark world is created by Kefka, Locke finds the Pheonix esper. Locke attempts to revive Rachel but the magicite didn’t have enough power and only revives her long enough for her to tell him give his love to the one who now dwells in his heart. At this point of the game he had already been falling for Celes for a while, and this was the last thing he needed to move on to her and join the party to fight Kefka. Celes is originally saved by Locke early in the game and Locke promises to protect her. They have their ups and downs, but ultimately they fall for each other. I will explain more in depth on that when I dive into Celes’ theme. 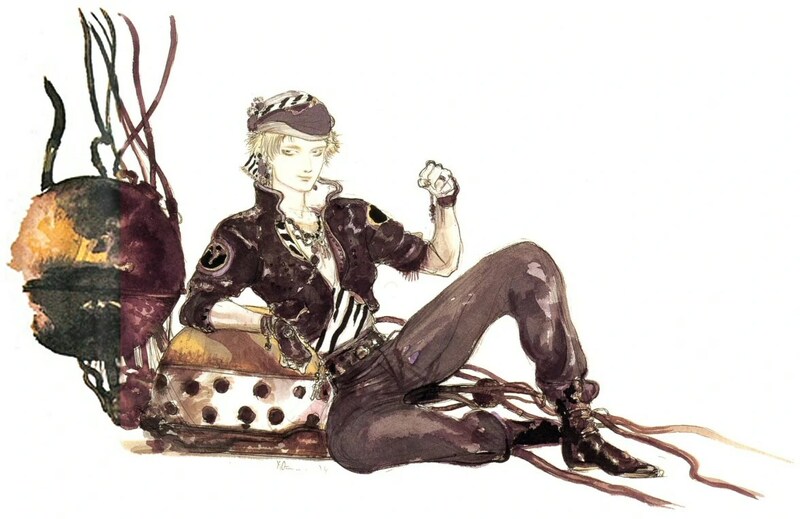 Taking a look at these pictures we have a couple sprites of the in-game Locke right above and a more in depth image to give you a little more to visualize what his character is like at the very top of this post (this secondary art done by Yoshitaka Amano exists of just about everything important in FFVI, and I love how well it depicts the style of the game with the it’s own style of art). His sprites and Amano art work really do his character good, and give a really good depiction of his character. Locke’s theme isn’t my favorite of the character themes, but no one’s theme says “HERO!! !” like Locke’s. His theme sounds just like it should for the kind of swooping in to save the day hero that Locke normally is. I love the way that his theme sort of completes his character. From his story, and in general his moments in the game, the player mostly sees how guilt-ridden he is, and this theme doesn’t show that at all. What this theme shows is how Locke handles his guilt and problems by always doing as much as he can to protect what he loves and always better himself. His theme shows that Locke is not willing to let himself cause what he finds as a failure again and will be the hero he wants to be to cover it up. Side Note: Locke has a secret lair. He’s a sneaky character. His (original) girl is name Rachel and she is killed by the antagonist. Locke is the Batman.